Free Tactical Pen – Order Yours Here! Best Tactical Pen: 2019 Update! FTC Compliance Notice: We have advertiser and affiliate relationships with companies mentioned on these pages. We may earn money from the companies mentioned here. Tactical Pen! Information, Resources and Training Guides. We are the information center for the Tactical Pen: what it is, how it is used, what its origin is, how it is distinguishable from similar strike weapons, self defense tools and more. We are also the home of the premier Free Tactical Pen offer online. 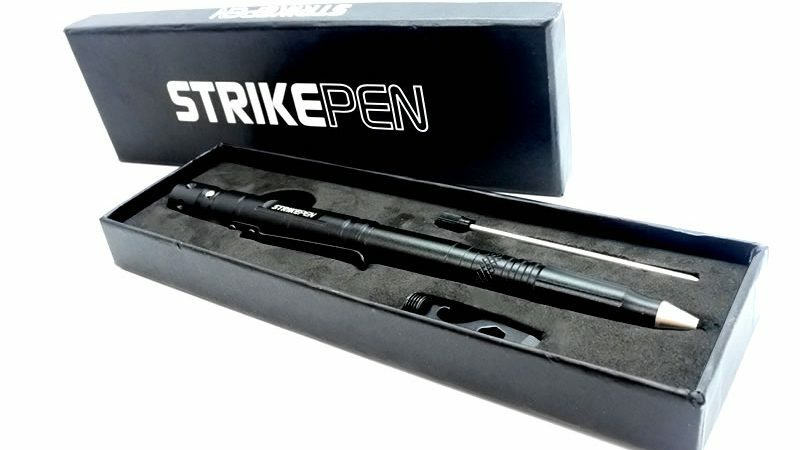 What is a Tactical Pen (also called a Strike Pen)? At the most basic, these are a variation of the Kubotan, a martial arts weapon comprised of a short stick, up to 6 inches long, which was introduced to female police officers of the Los Angeles police force in the mid 1960’s. Click Here for More on the Kubotan and its Creator. Composed of aluminium, steel or titanium, these look and function as normal pens for writing, and as such, are easily concealable. Because they can be carried in a pocket or bag, they are also easily and quickly accessible if needed. Essentially, these are metal re-inforced pens used for self defense through direct, precise strokes. Aircraft grade aluminium is a popular option for the design of a tactical pen. It allows for a light, but powerful shaft. Other utilities may additionally be integrated to produce a multifunctional tool: a glass breaker, dna sample collector and LED Flashlight, for example. The shaft of a self defense pen is designed for maximum grip and is thus often grooved or furrowed. Is a Tactical Pen Practical? This is a major question. Strike Pens can be very effective, but they must be used by a person properly trained to wield them. This is particularly so for many female users or people of smaller build. We do have a number of demonstrative videos onsite and we offer resources for training and study. The formal techniques for using these weapons are designed to target specific areas of the body in close contact, with quick, efficient strokes that deliver maximum impact in order to disable an attacker immediately. Note: for Women, please take note of our relevant page: Tactical Pen Use for Women! Are Tactical Pen’s Legal to Carry? Tactical pens do not carry an official classification as weapons nationwide, but this may vary within certain local jurisdictions. However, you may be restricted from keeping them on you in certain instances, such as boarding an airplane. Because this is an important and unclear subject of discussion, we have much more on our article: Are Tactical Pens Legal? Depending on the design, manufacturer and range of functionality of the device, these range on average from about $10 up to $100. The low cost, for a self defense tool, makes these a very practical option for self defense and protection. We are the home of the Web’s most popular Free Tactical Pen offer. Order today and pay only for a low shipping and handling fee. See Our Selection of the Best Tactical Pens! Order Your Free Tactical Pen! Tactical Pen TSA Rules: Are They Legal to Carry on Planes?